L-R : Rohime B Shafie, Head of Automotive, DRB-HICOM, Rudrarup Maitra, Head International Business, Commercial Vehicles, H. E. Shri Mridul Kumar, High Commissioner of India to Malaysia, YBhg Dato’ Abdul Harith Abdullah, Chief Operating Officer, Automotive Distribution, Defence, Manufacturing & Engineering of DRB-HICOM, Rustom Nagporewalla, Regional Manager – ASEAN, Far East, Russia & CIS, Mr Chin Tan Hee, Chief Operating Officer of DHCV. Tata Motors, India’s largest commercial vehicle manufacturer, along with its authorized distributor DRB-HICOM Commercial Vehicles Sdn. Bhd. (DHCV), today launched the Tata Super Ace and the Ultra range of commercial vehicles in Malaysia. These vehicles have been designed for the modern commercial vehicle customer, with superior performance, world-class cabins, high load carrying capacity and flexible body-load configurations. The Tata Super Ace is a 1 ton mini-truck from Tata Motors, for inter-city and intra-city transportation solutions. Optimally powered by a 1405 cc diesel engine, combined with a new body design and cutting edge technology, the Tata Super Ace will offer customers with an opportunity to start their dream business with a very small investment. The Tata Super Ace is based on the popular Tata Ace mini-truck from Tata Motors. Having sold over a million units since it was first launched in 2005, the Tata Ace has been a revolutionary product and is a result of Tata Motors deep understanding of the market and consumer. The Tata Ace has been a preferred choice for last-mile transportation with a footprint spanning 28 countries across South Asia, Africa and the ASEAN. The Tata Super Ace can be customized for various small scale business operations, for the transportation of construction items, food grains, fruits, FMCG and white goods or could be configured to be a food truck, an ice cream truck or a mobile store on wheels. 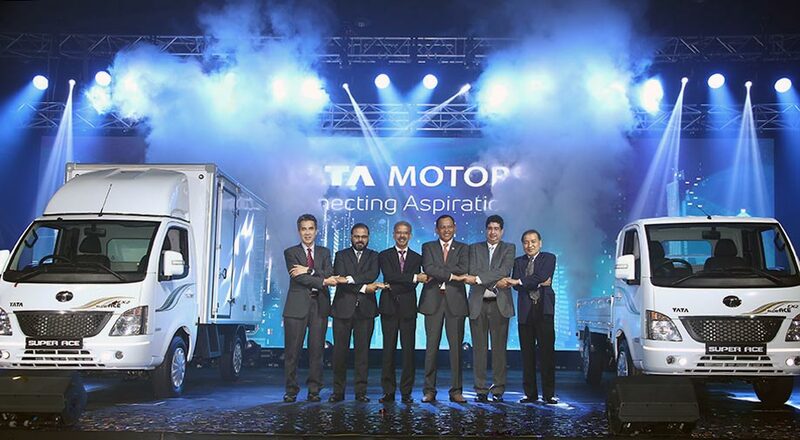 Based on a combination of world-class performance parameters, with enhanced levels of durability and reliability of the ULTRA platform, this range will enable Tata Motors to set new benchmarks in the Intermediate commercial vehicles space in Malaysia. A combination of driver comfort, high load carrying-capacity and safety, along with best life-cycle cost, makes this new offering from Tata Motors, versatile for various applications. The Ultra 814 offers enhanced levels of durability and reliability on the ULTRA platform. It is powered by new generation NG 3.0 Lt CRDI engine coupled with next generation transmission. Available in 4.5T Payload with highest body option of 5.5M, Tata Ultra provides customers complete flexibility, for varying business requirements. All these together make the ULTRA 814 a reliable asset and the most efficient solution for optimum business profitability. The ULTRA 1014 offers faster turnaround time and enhanced profitability for any goods carrying business, making it an ideal work-horse for movement of materials across distances. The driveline of the ULTRA 1014, has the latest NG 3.0Lt engine with an output of 140 HP, a new-generation transmission with aluminum casing – the 6 Speed – G-550 overdrive gear box, with cable-shift mechanism and axle technology, with reduced weight, ensures superior performance and greater fuel efficiency for varied payloads. The longer wheelbase of 4530 mm makes Tata Ultra the perfect Business Utility Vehicle, suitable for varying business applications such as FMCG, white goods etc. Speaking at the event, DRB-HICOM’s Dato’ Abdul Harith Abdullah, Chief Operating Officer, Automotive Distribution, Defence and Manufacturing & Engineering said, the launch was a key milestone for the Group in getting a foothold of the growing CV market in Malaysia. “With these new products unveiled today, which are competitively priced with superior features, we are confident it will gain traction amongst our target users in the near term. DHCV’s deep expertise in the area of importing, assembling and distributing foreign marques in Malaysia is well established since 1979. Harith added that they are very confident about the market acceptance of the new Ultra variants and specifically, Tata Super Ace which is expected to be popular with small business owners across Malaysia. DHCV and Tata Motors say they will continue to explore new potentials, customer’s preference and conduct researches for new product variants to sustain their growth and expansion for the medium to long term. Customers in Malaysia are currently served by a network of 24 outlets located at strategic locations and in major townships, nationwide. DHCV aims to expand this reach in tandem with sales growth and market. A wholly owned subsidiary of DRB-HICOM BHD, DRB-HICOM Commercial Vehicles (DHCV) was established in 1979 for the purpose of importing, assembling and distributing passengers and commercial vehicle segment. Upon signing of the Importation, Distribution and Technology License Agreements with Tata Motors Limited, India (Tata Motors) in September 2013, DHCV was appointed as the exclusive distributor of Tata Motors commercial vehicles as well as expand its vehicle assembly business and distribution network in Malaysia. DRB-HICOM Berhad (“DRB-HICOM”) is one of Malaysia’s leading conglomerates with core businesses in the Automotive and Defence; Services; and Property, Asset & Construction sectors. With more than 90 active companies in its stable and over 60,000 employees group-wide, DRB-HICOM’s aim is to continue adding value and propelling the nation’s development. In the Automotive and Defence sector, DRB-HICOM is involved in the manufacturing, assembly and distribution of passenger and commercial vehicles, including composites component supply for aircrafts. In Services, DRB-HICOM is involved in various businesses, including concession and financial-related services. In Property, Asset & Construction, DRB-HICOM is involved in residential and commercial developments.